Hungry for adrenaline? Here at Radical Reality we deliver the latest VR experiences for any event or party. Book our RADICAL VR Simulator for the ultimate party thrill. WHAT IS RADICAL VR SIMULATOR ? The RADICAL VR SIMULATOR is the latest virtual reality platform that combines ground-breaking technology to let you play in a way that’s never been possible before. From extreme sports to adventuring through dinosaur infested landscapes, you’re taken right into the game you choose. Take risks, try something new, or explore a different reality – Extreme Machine is the new way to experience extreme sports. You’ll be fully immersed from the moment you slip the goggles on. The virtual reality headset is combined with an incredible vibrating platform, stunning surround sound, and leading wind technology to give you realistic sensations. You’re free to explore the worlds you select and experience all the sensations you’d expect. From free falling to a high-speed chase, get ready to try the next generation of Virtual Reality. Are you ready to experience the extreme realistic experiences available on Extreme Machine? Book our ultimate VR experience NOW! The latest Oculus Rift VR headset guarantees the best graphics quality and 360° view in virtual 3D world. Advanced technologies transform your body into joystick to take control over the game process. The platform is equipped with realistic vibrations’ generating system in order to improve your VR world events’ perception. We offer enhanced branding and design options according to customer’s needs. High quality interactive VR rides and games will take you into the world of extreme sports and adrenaline sensations. Our VR platform is equipped with a targeted wind flow generation system adding more realism and thrill to your experience. Dynamic surround sound provides total immersion and sense of realism. Here at Radical Reality, we make your event entertainment hassle-free and unforgettable. We’re experts at delivering technology driven fun at a huge range of events. Combined with our revolutionary VR setup, we guarantee to deliver the ultimate virtual reality experience to you and all your guests. We let you showcase the next generation of gaming technology, transporting your guests to a destination of their choosing. Whether you’re planning an epic party for family and friends or a professional conference, we’ve got the insights to not only deliver a leading VR setup but ensure you get the most out of it too. 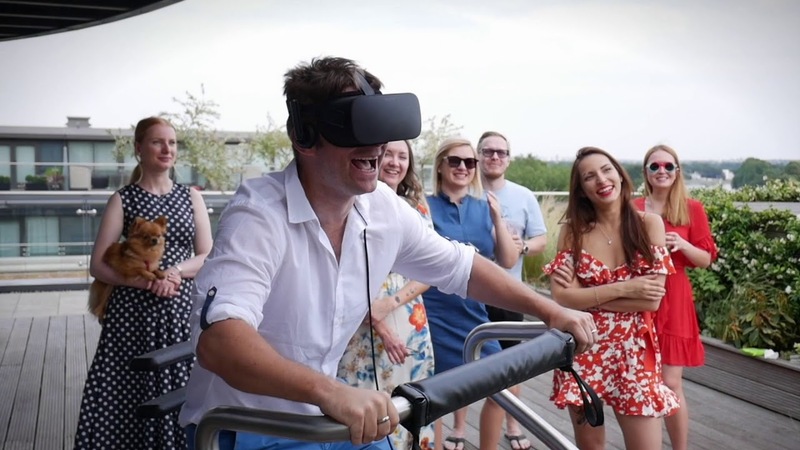 Our expert team can even brand the VR experiences to match your event. If you’re seeking to boost brand awareness, for example, at a prestigious expo, we can craft bespoke options that show off your business to create a buzz.